When you upload files to Google Docs, you'll notice a new option that tells Google to convert the text from PDF and image files to Google Docs documents. The feature has been released last year as an experiment, so Google had enough time to improve the accuracy of the results. 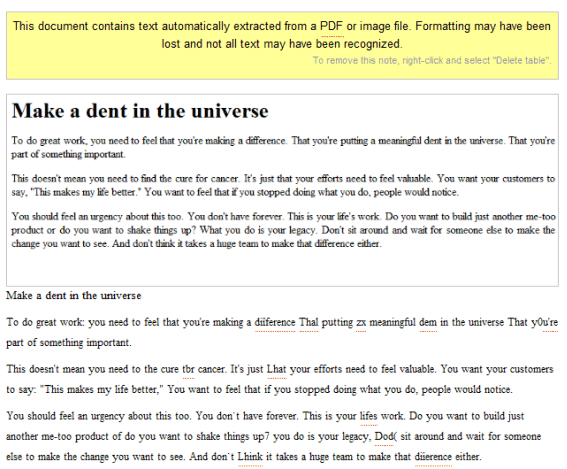 I've tried to convert an excerpt from the book Rework and the result wasn't great. About 10% of the text has been incorrectly converted and the formatting hasn't been preserved. "This document contains text automatically extracted from a PDF or image file. Formatting may have been lost and not all text may have been recognized," explained Google in a note included in the document. Update: Google Docs Blog says that this feature only works for the following languages: English, French, Italian, German and Spanish. "For the technically curious: we're using Optical Character Recognition (OCR) that our friends from Google Books helped us set up. OCR works best with high-resolution images, and not all formatting may be preserved." What about existing PDF's that need OCR??? If the alphabetic recognition comes back with "making a diiference", in which "diiference" isn't a recognized English word, their system should be able to match with high probability the garbled phrase to the correct English "making a difference". They could additionally add a comment there with the original OCR result. Also, in the phrase "that you're putting", the OCR has completely removed the word "you're". Given some reasonable probability that a section is a possible word, they could crop out (they know the line height in context) and include an inline image in the document, which when clicked would give the option to replace it with text. 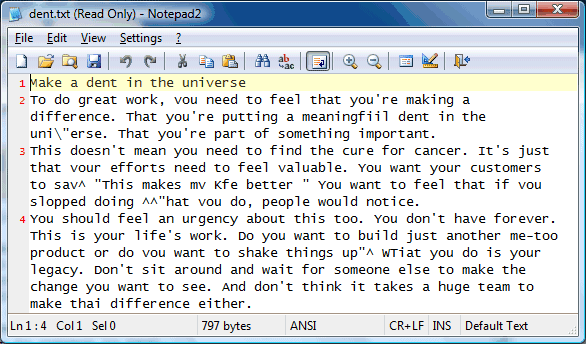 Anonymous, pretty awesome and insightful suggestions. I hope Google reads them. I don't see it either, Toby. I don't see why it wouldn't be possible, though (probably will come eventually). What blows my mind is that I just found out about this (OCR) and it already works for me ("as is") . . . yet I still don't have the new docs editor/format or the revamped sharing functionality. How do they "roll out" new features, anyway? By user account or what? I don't see myself using this. It takes the PDF and creates a Word doc out of it??? I would much rather something like Evernote. The PDF file is preserved but you can still search the text in it (if you are a premium member). I don't think the point is to have a "Word doc;" I think the point is to have a pdf transformed into a dynamic, easily sharable, online document that can be edited with collaborative ease. Any idea if it supports Japanese kanji? I am using the same OCR library to build qiqqa.com and can testify to the fact that it is an interesting technical problem to know if you should "coerce" the OCR output you see to their nearest English words - especially in scientific literature. Sometimes it makes it worse! But yeah, hopefully frequent triplets like making a diiference" should be reliably alterable! I love to see this progress though! Same question here. Why dont they use the google n-grams to correct the phrases? Does anyone know if the OCR being incorporated in Google Docs is the Tesseract engine. I would guess that it is, but I hate to guess. Will there be an API for this functionality? Unfortunately, I have to give a thumbs down, way down. Google OCR fails completely (resulting document is empty or contains a single fax number) in contrast with Acrobat 7.0 which completes OCR of image of text that is a mixture of Greek and english and contains email addresses (with latin characters). Acrobat gets all the email addresses (my goal, here). Resolution is 15-20 pixels per character height. Did not work for me either. I tried with a 74-page PDF but the converted doc had only the first couple of pages. It goes nuts when there are tables too. Make no mistake, no OCR on this planet can guarantee 100% correct conversions all the time, including Google's latest entry. This leads to frustration and disbelief. No one tells you that including Google. (Unless of course your documents are picture perfect all the time). Which means you must proofread every comma, fulstop and every character converted - so if you PDF is 75 pages it will be a pain & you will take ages. Unless its supported by manual prrofreading & line editing OCR may not always work for every one all the time! Does not work. Does not even tell why. Just says "couldn not upload". Me parece fatástica la nueva caracteristica añadida a google docs. Esta gente si que sabe aportar valor añadido a sus productos. Que sigan así. How much did Adobe pay you? This is really useful for us students who dont want to print the pdf lecture slides onto paper that the professor has posted, and would like to type the additional notes. 1) Scanned a 2-page paper doc (some plain text, some texty images) at 300dpi to 'blind' PDF [800kb]. Blind meaning no searchable text, just an image. 2) Input PDF to free-online-ocr (FOO). 4) It looked exactly like the original. Searched for words that FOO and Google Docs (GDX) had trouble converting to text formats in previous combos. No trouble. As far as I can tell EVERY word in this PDF (although not in the images in the PDF) was searchable. This is where I lost my sox. 5A) Uploaded to GDX without conversion to GDX format. Every word remained searchable. 5B) Uploaded to GDX WITH conversion to GDX format...all the trouble words are messed up again. Moving forward I'll convert 'blind' pdfs to searchable pdfs via FOO then upload to GDX for searchable storage. I think that http://www.e-ocr.com resolve this problem. OCR is important too, but as long as "fuzzy search" works to a point where you can find the keywords you search on... then that would be a good feature as well. I know it doesn't help those looking to convert documents to text, but I am specifically look at archiving documents and being able to search on them when the need arises. 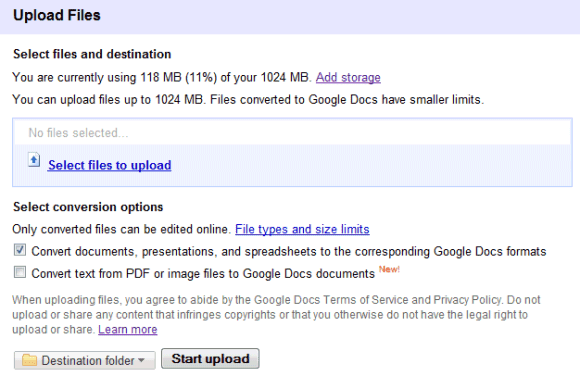 Wonder how good Google OCR is - I uploaded an 88 page patent file and it seems I can seach down to page 10. Haven't looked at the fidelity or anything yet. But bummer, seems to stop after page 10... I'll wait and see if time will convert more - but doubt.